Nine Mile Creek is a bluegrass band playing traditional and original bluegrass, with a touch of swing and Americana. Long time fans of the bluegrass genre and those appreciating the joys of good acoustic music are embracing Nine Mile Creek’s fresh approach. Full-on up tempo rhythms underpinned by Andrew’s bass and Kevin’s guitar are a feature of the band’s sound. This provides a platform from where Mark’s hard-driving mandolin and Colin’s banjo brings traditional bluegrass tunes to life, all nicely rounded out by Tanya’s fiddle playing. Lead vocal duties are shared, and two, three and four-part harmonies make for an exciting, toe-tapping musical experience. Mark Pottenger and Andrew Barcham were keen to continue the experience they’d had playing in previous bands, and with Colin Weight on banjo, formed a trio that performed at the Kelly Country Pick in 2012. Kevin Parsell joined in early 2014, and Tanya Balka completed the line up to make Nine Mile Creek what it is today. 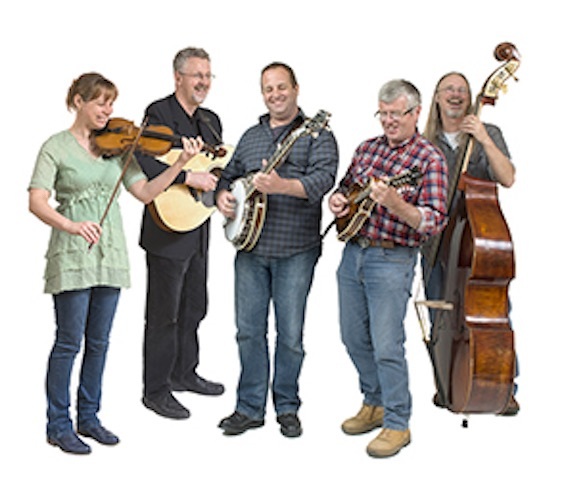 The band is building a strong repertoire and is a regular contributor to the Mountain Pickers Association’s monthly night at Burrinja Café in Upwey. In 2013 they performed at the Great Alpine Pick in Harrietville, closely followed by a support slot for New Zealand band The Pipi Pickers. They also perform at non-bluegrass events, introducing the joys of bluegrass music to enthused audiences. Expect Nine Mile Creek to become regular performers at bluegrass and other music festivals and events, as they entertain audiences with their special blend of hi-octane traditional and original material. Jan Dale’s radio program, Southern Style can also be streamed to your computer, so you might like to also catch Jan’s special in the archives of the PBS website.